I awoke in the small northwest corner of AZ and drove just a few miles north on I15 to St. George, UT all while it was still dark. 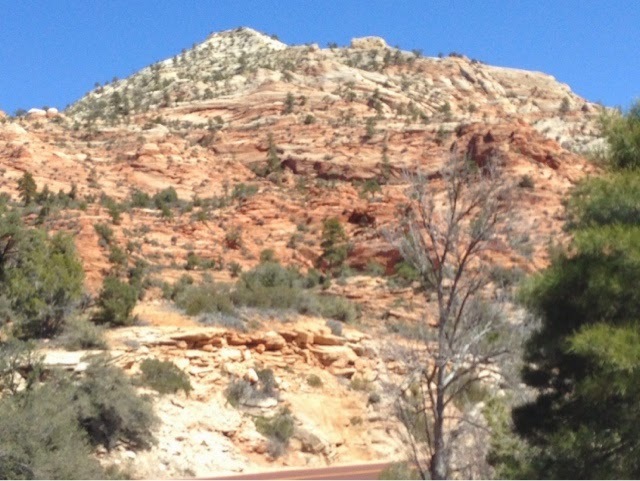 I am now in the Mountain Time Zone. I hung out in a McDonalds in St. George working my blog as I didn't have internet last night. Of course I also pulled my downloads. 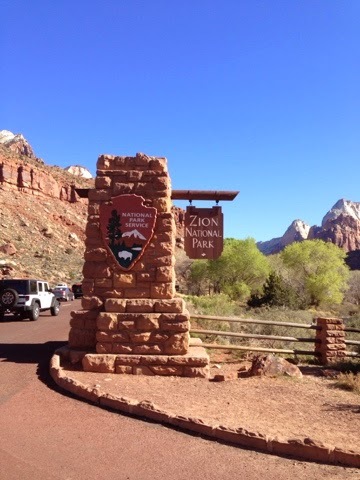 My plan is to visit Zion National Park today a few miles away. 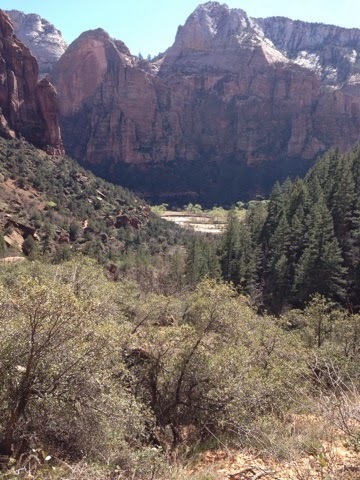 I had been to Zion in the mid 1980's. 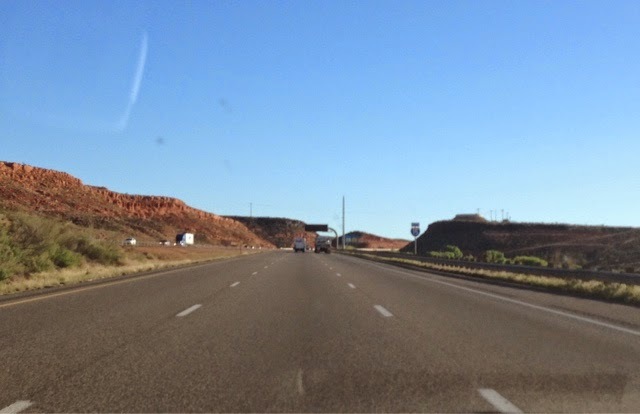 Another short drive north on I15 and I head off on route 9 east to Hurricane, UT where I stop at Walmart for groceries before continuing to the next smaller but quaint town of Springdale, UT, at theventrancevto Zion. 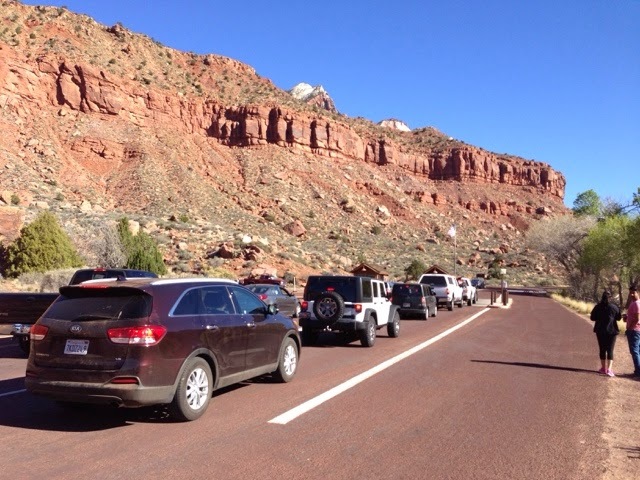 I had been listening to AM 1610 for park information and they were making it clear that parking at the park's visitor center fills up very fast in the AM so plan to park in town and take a free shuttle to the visitor center. 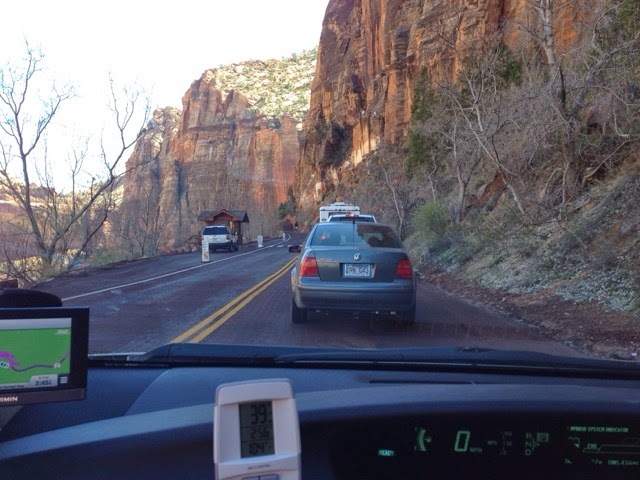 I arrive before 9:00 AM and people are parking in town all along the sides of the road. I just happen to find a side of road parking spot not far from the park's toll booth. The traffic to get into the park is all backed up so I walk past the cars and get in line in front of the car waiting and when the car being serviced finishes I jump in and show my badge and I get the park's brochure. 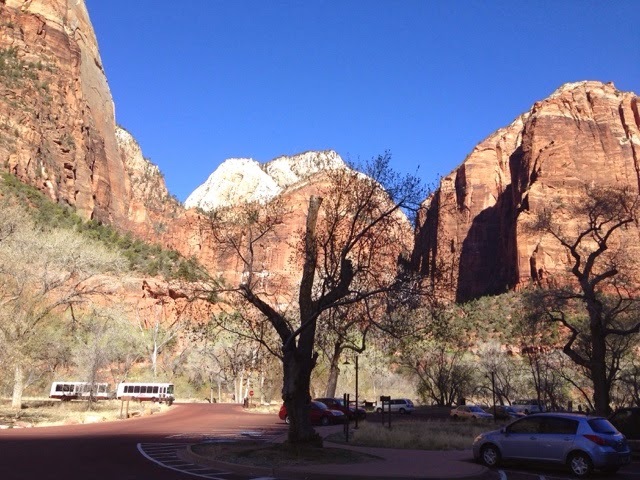 I walk about 2000 feet to the visitors center to pick up the free shuttle for a ride on the Zion Scenic Drive. The general population are not allowed to drive it anymore. It's the free shuttle or you don't go. Along the way there are wonderful views but the enclosed bus makes it hard to take any pictures. 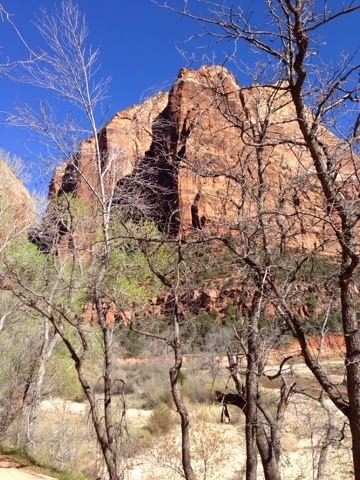 I take the bus to the Zion Lodge. 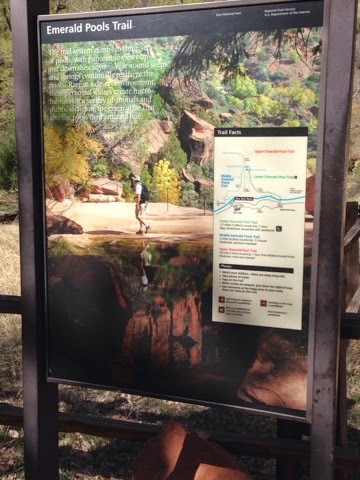 I got off here to hike the Emerald Pools Trail and decide to hike it to the upper pools. This is most likely one of the more popular things to do. 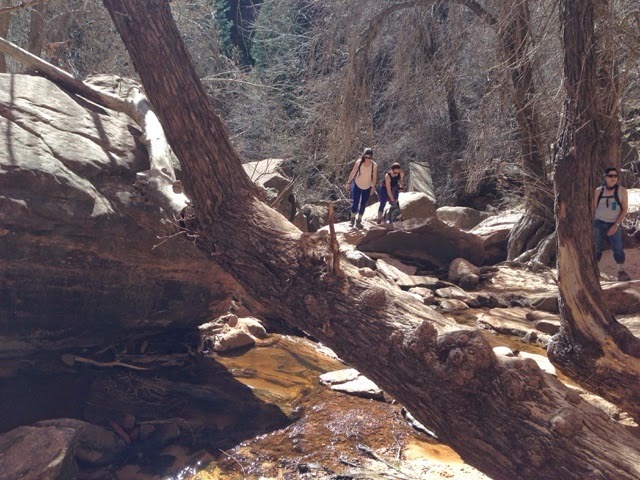 There are many people on the trail. Just short of being crowded. You have a great view of every turn. 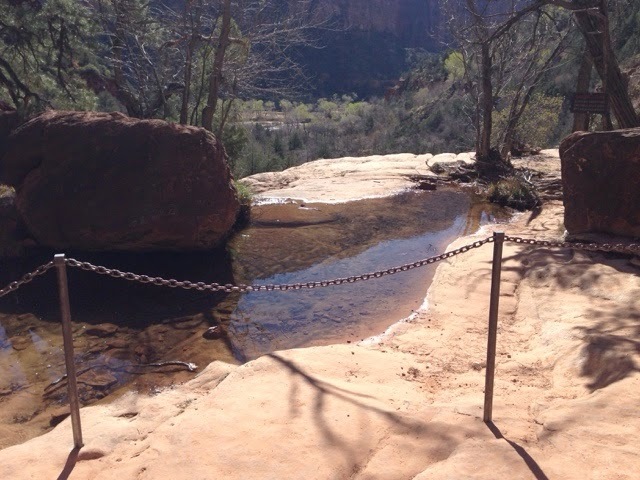 The lower pools are formed from falling water you walk under on the trail. Plan to get a little wet. Fall off the face of the rock below. 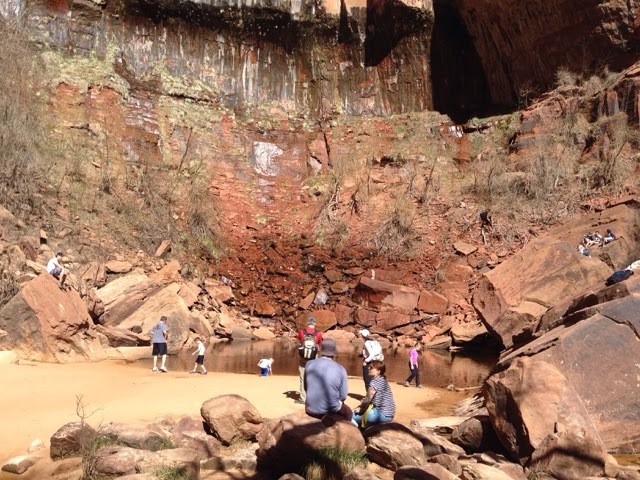 The upper pools are large and worth the 1.6 round trip hike up a moderately steep trail. This is looking down at the final climb. You do get some nice views heading back down. On the way down I met "inspiration". 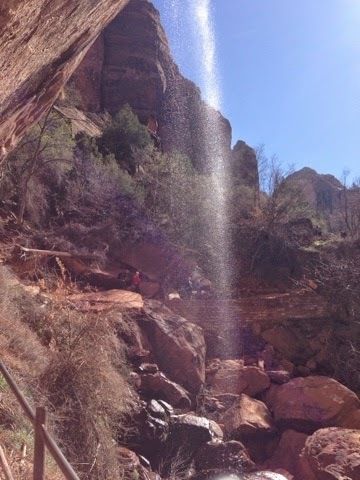 She was a 60 something woman climbing the last section to the upper pools while on oxygen through nasal cannula. I then came across a guy that I was giving encouragement to and he sounded like he was going to give up climbing. I then told him I just saw "inspiration" and if she can do it he can to. He then said she passed him. He said he asked to breath some of her O2. I told him he could do it if she could. 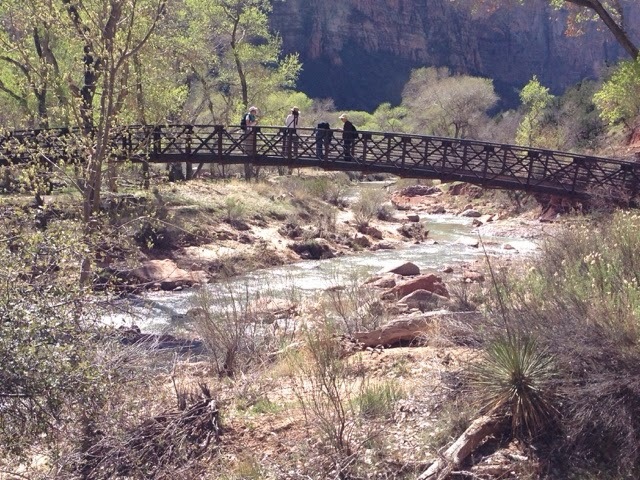 At the bottom across from the lodge the trail goes over this bridge. 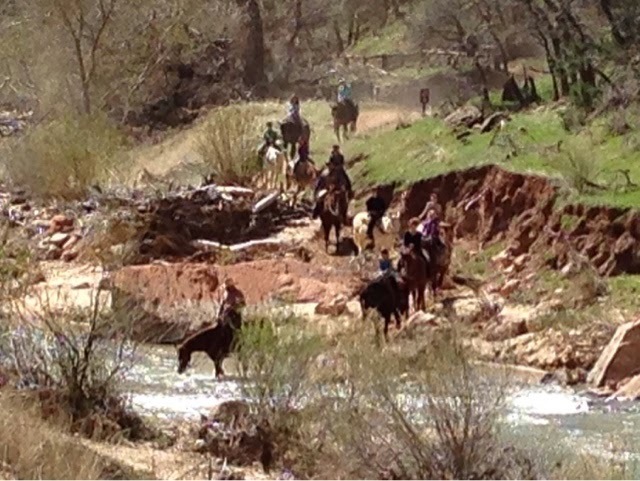 Once I got to the bridge I noticed this group of horseback riders crossing the river. The lodge offers equestrian experience. 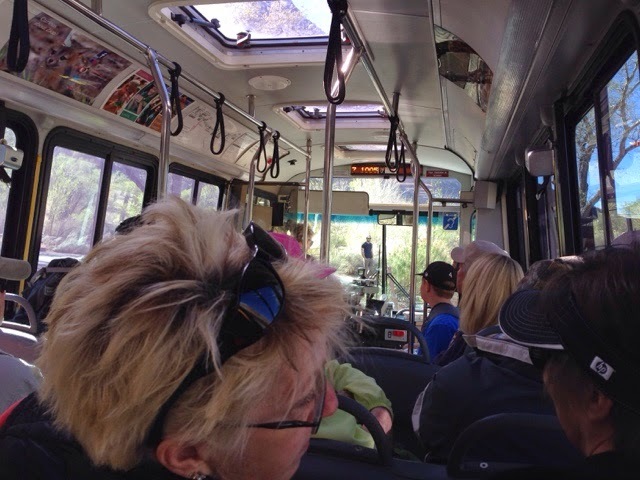 I picked up the bus and there were only a few headed back to the visitors center so I sat upfront and met our driver Clyde. He has been driving for the park for seven years. Many people that retire jobs at home decide to get these kind of jobs and move to a better climate. 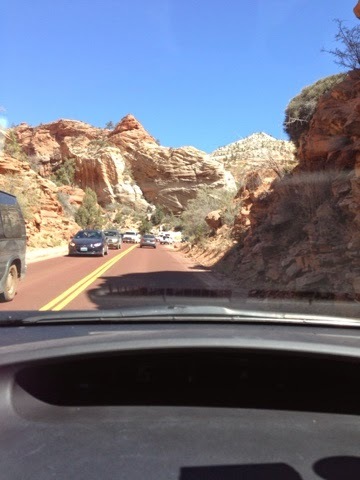 After I get back to the Visitors Center on the bus I then head to my car as Zion NP is not only the Scenic Drive. 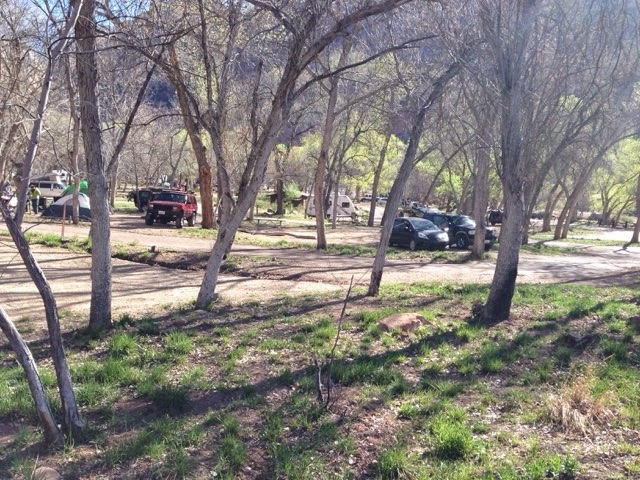 It was now afternoon and I had thought about staying for the night, but the campground is full. I drive to the gate and show my card this time driving and I am headed on Route 9 through the park to come out ont he east side. 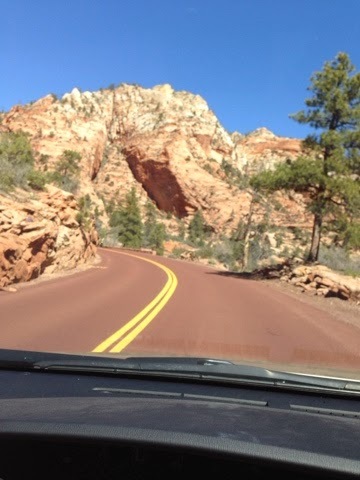 I drive up a series switchbacks on the road and take pictures as I go. 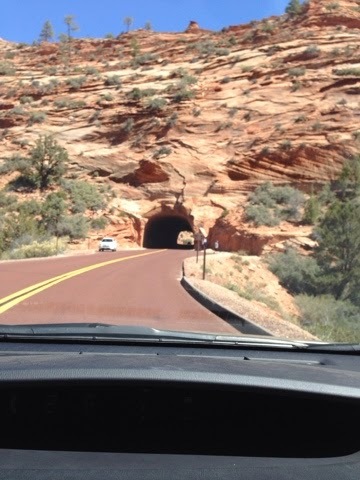 I eventually come to the 1.1 mile tunnel through the mountain. When you come out of the tunnel it's like you come out in a whole different geological world. On this side you can see what looks like flaking of the layers of stone. Although the scenery is different I find it very appealing and just as worthy of seeing as the other side. Route 9 eventually ends in a valley and I take a left (north) on US 89 towsrds Bryce Canyon National Park. 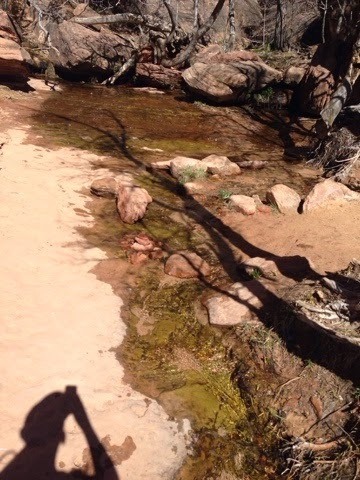 Although I landed there tonight in their campground I will cover Bryce NP in tomorrow's blog. Very pretty pictures! The horse-back riding tour looks fun.